All Cannings is likely to be quite busy during the concert period so please make sure you arrive in plenty of time and please drive with care. Vehicles through All Cannings will be restricted to residents and emergency vehicles only. If at all possible use public transport to arrive and depart. All vehicles must be removed from all car parks after the event has finished. There is no overnight parking allowed. The bar areas, food and drink stalls and merchandising areas will be cash only. There are no credit/debit card facilities available and no cash machines in All Cannings village. Please ensure you bring cash or cheque books with you. To ensure the day goes as well as possible and everyone enjoys the performances and atmosphere, we’ve a list of items that can’t be brought onto the concert site. But please bring smiles and appreciation for the performers! No alcohol or food is permitted to be brought into the venue. No glass containers or cans will be allowed on to the site. Water in plastic bottles will be allowed into the venue. The following articles must not be brought into the venue: barbecues, fireworks, knives, smoke canisters, air horns, flares, weapons, dangerous or hazardous items, laser devices, bottles or glass vessels, cans, poles or any article that might be used as a weapon or that may compromise public safety. Any person in possession of such items will be refused entry into or ejected from the event site. No animals are allowed at this event except guide dogs. Carparking is £5 per car for the day. There is no overnight camping. This is an outdoor concert, please come prepared in the event of inclement weather. The concert will go ahead come rain or shine, but please do not use umbrellas in front of the stage during the performance. The walk from the North car park is about 10 minutes and a few minutes quicker from the South car park. The route is along mainly level roads, but there is a rough track out from the car parks. For Blue badge holders, there is parking in the Platinum car park. For those with specific requirements, please contact us in advance for arrangements we can make for transportation from the car parks to the event arena. There is a raised viewing platform for disabled ticket holders, but limited availability and space. Please contact us via the contact form or call 01380 860328 to discuss reserving a space here if required. There are disabled toilets adjacent to the viewing platform. The Kings Arms in All Cannings has been run by Richard Baulu and Virginia Long since June 2003. The pub is a ‘real pub’, that serves good homemade food, with menus changing daily and first class ales, wines and cider. Richard has won 3 Gold awards, a silver and a bronze for keeping ‘a perfect pint’ and good cellar management. AA Road signs will direct you towards All Cannings and the main public car park and the Platinum car park. These are located at the following road side locations. A361 – London Road at the Horton turn off. A342 – Andover Road at the Chirton turn. Whichever direction you are arriving from please then follow the remaining AA signs to the relevent car park. Parking will be charged at £5 per vehicle. 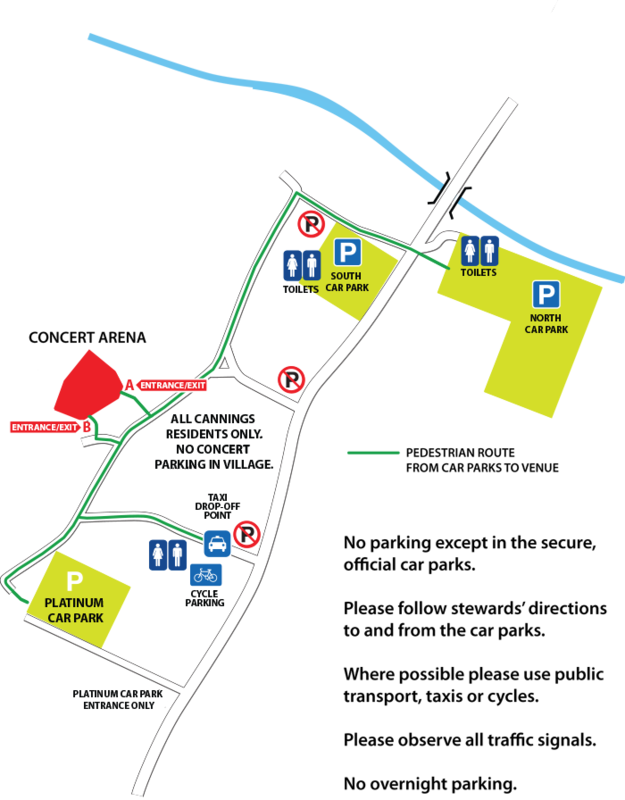 The main Public Car Park is situated on the edge of All Cannings and is shown on the map below. The entrance is off Lipgate as you approach All Cannings. Please look out for Public Parking signs as you approach All Cannings. Entrance is off Lipgate as you approach All Cannings this is shown on the map above. Once parked, Platinum Ticket holders will be driven to the site entrance and shown to the marquee. Secure bicycle parking will be in the school grounds in Chandlers Lane. There will be stewards on hand around the village to keep an eye on people’s bikes and property the whole time the event is running. But please make sure you lock your bikes up. Please only park bikes in the designated parking areas. Bicycle are parked at owners’ risk. Concerts At The Kings and the event organisers cannot be held responsible for any loss or damage to bicycles.